Habit: [Subshrub], shrub. Stem: generally many from base. Leaf: alternate, generally drought-deciduous, simple, petioled, entire or rarely toothed. Inflorescence: heads radiate or discoid, 1 or in panicle-like cluster; peduncle generally long; involucre hemispheric; phyllaries graduated in 2--4+ series, free; receptacle paleate, palea folded around and falling with fruit. Ray Flower: sterile; style 0; ray yellow. 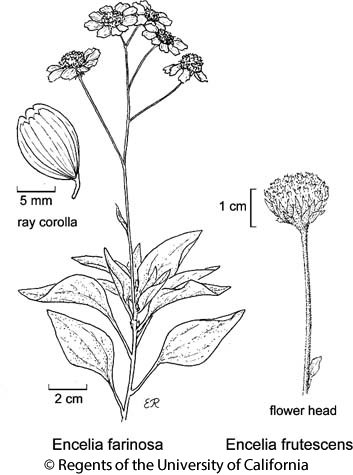 Disk Flower: many; corolla yellow or brown-purple, tube slender, throat abruptly expanded, lobes triangular; anther tip ovate, +- acute; style tips triangular. Fruit: strongly compressed, obovate or wedge-shaped; edges long-ciliate; faces glabrous or short-hairy; pappus of 2 narrow scales or 0. Species In Genus: 11--12 species: western North America, western South America. Etymology: (Christoph Entzelt, German naturalist, 1517--1583) Note: Commonly hybridizing, especially in disturbed areas; Encelia farinosa × Encelia frutescens is common; Encelia farinosa × Encelia californica, Encelia farinosa × Encelia actoni, Encelia actoni × Encelia frutescens, Encelia frutescens × Encelia virginensis, Encelia farinosa × Geraea canescens have been reported. Habit: Shrub 3--15 dm, from 1 or several trunks; sap fragrant. Stem: much-branched above; young stem tomentose; older stem with smooth bark. Leaf: clustered near stem tip; petiole 10--20 mm; blade 2--7 cm, ovate to lanceolate, obtuse or acute, silver- or gray-tomentose. Inflorescence: heads radiate, 3--9 in tight panicle-like cluster; peduncle +- yellow, glabrous except just below heads; involucre 4--10 mm; phyllaries lanceolate. Ray Flower: 11--21; ray 8--12 mm. Disk Flower: corolla 5--6 mm, yellow or brown-purple. Fruit: 3--6 mm; pappus 0. Chromosomes: 2n=36. Ecology: Coastal scrub, stony desert hillsides; Elevation: < 1500 m. Bioregional Distribution: e SCo, adjacent PR, D; Distribution Outside California: to southwestern Utah, northwestern Mexico. Flowering Time: Jan--Jun, Aug--Sep Note: Widely planted, especially along highways; may persist or escape outside native range. Dried resin used as incense. Synonyms: Encelia farinosa var. phenicodonta (S.F. Blake) I.M. Johnst. Citation for this treatment: David J. Keil & Curtis Clark 2012, Encelia farinosa, in Jepson Flora Project (eds.) Jepson eFlora, http://ucjeps.berkeley.edu/eflora/eflora_display.php?tid=2557, accessed on April 21, 2019.
e SCo, adjacent PR, D; Markers link to CCH specimen records. Yellow markers indicate records that may provide evidence for eFlora range revision or may have georeferencing or identification issues. Purple markers indicate specimens collected from a garden, greenhouse, or other non-wild location.